Whether you are on the slopes at a ski resort, or commuting to and from work stay warm and in style with GearBuyer's selection of ski jackets at sale prices. 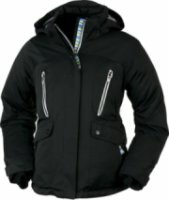 Many of our partner stores are having ski jacket sale prices on the best brands. 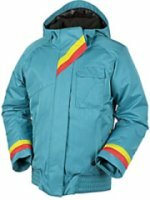 Obermeyer Zen Ski Jacket - The Obermeyer Zen Ski Jacket is longer than other styles, so it provides extra protection from wet lifts. Kids will love that this jacket is very warm, but not bulky or uncomfortable. When you put your little girl in the Zen Jacket you can be sure she'll stay toasty and dry while she plays in the snow. If you're taking her skiing you'll love how the bright colors and sweet styling make her easy to spot. 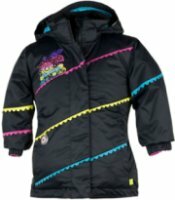 Spyder Glam Ski Jacket - Spyder Bitsy Glam Jacket - Toddler Girl's: Spyder clothing, girls, and glamour go hand in hand. 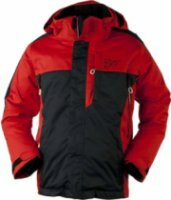 This super cute Spyder ski jacket features “Small to Tall” grow cuffs for multi-season use, and offers protection from the elements with an internal drawcord waist and taped critical seams that prohibit water penetration. Your glamour girl will never want to take her new favorite Spyder jacket off. Removable heavy weather hood. Custom embroidery on front panel. Removable hoodMid-lengthSlightly shapedAdjustable cuff tabs. Lining with extra warm high-pile fleecePrime 20 Stretch Twill 2 Ply: 100% Polyester, ECO DWR 80/10, 216 g/m220,000g BreathabilityFull length central mesh ventingRemovable hood20,000mm WaterproofRiri waterproof zipperBrushed hand pocketsMP3 Pocket. 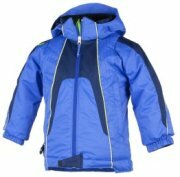 Obermeyer Downhill Ski Jacket - You can be sure your little guy is warm as he's racing down the hill in his Obermeyer Downhill Ski Jacket. 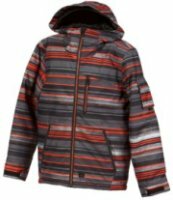 Obermeyer packed this kids' coat with insulation, but they used lightweight, low-profile insulation that doesn't feel bulky at all. The fabric is waterproof, so he can get right down in the snow and roll around without getting wet. Obermeyer coats are always extremely durable, which is great because with I-Grow extendable sleeves, he'll have the Downhill Jacket for several seasons to come. 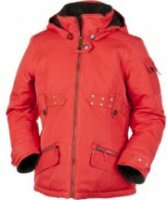 Jupa Elena Ski Jacket - The standout style of the Jupa Elena Ski Jacket will catch her eye. The serious performance and breathable weatherproofing will keep her warm and dry. Critical seam taping and water-repellent zippers keep moisture out. A removable hood gives her options to combat the weather. 140g of Thermadux insulation provides tons of warmth without making her feel bulky or restricted. The Jupa Elena Jacket has tons of pockets so she can pack all her snacks and essentials. 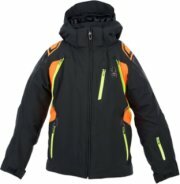 Jupa Evgeny Ski Jacket - Jupa’s Evgeny Ski Jacket has a cool freeride style that he'll love to wear. It's also got all the features that will keep him warm and dry. The fabric is waterproof and the seams are taped so he'll stay dry even if he takes a spill. Thermadux® high-loft insulation traps heat, so he can stay comfortable from the first chair to the last run. Plenty of pockets allow him to stow all his important items, snacks, and gear. Alouva Lined CollarPolysatin LiningThermik1 InsulationInner Snow CuffSilver Embroidery and Trims. 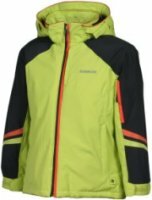 Salomon Superfast Ski Jacket - The Salomon Superfast ski jacket is a comfortable, light-weight jacket ideal for Nordic skiers who like to build a little momentum. 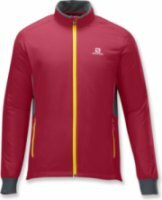 The jacket uses Salomon's SMART SKIN and ClimaWIND technologies to reduce the effect of wind and help make the cold bearable. The actiTHERM stretch poly knit helps the slim fit Superfast jacket wick moisture from your skin and keep you dry and warm. With two zipped pockets you can store your gear and keep moving in comfort. 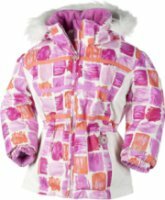 Obermeyer Bombdiggity Ski Jacket - Obermeyer Bombdiggity Jacket - Junior Girl's: The perfect drop waist with a removable fur-lined hood make the Bombdiggity a true winter wonder. Faux metal zippers, stretch inner cuffs and an integrated powder skirt make this jacket super cute on the mountain and a head turner on the street. Fabric/Coating: Pinstripe - 100% polyester mini-herringbone with HydroBlockInsulation/Lining: Permaloft 120gm body; 100gm sleeve; 60gm hood; Strong Cire - 100% nylon taffetaFit: Bomber StylePolaron Fleece - lined collarAdjustable sleeve cuffsFaux metal zippersInside goggle pocketIntegrated powder skirtExternal stormflap. 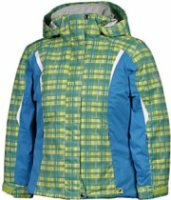 Obermeyer Alice Ski Jacket - The Obermeyer Alice Ski Jacket comes in bright colors and bold patterns. It's also very durable, reliably waterproof, and warmly insulated. Girls can ski, sled, and walk to the school bus while staying perfectly comfortable in this cute style. Obermeyer kids' jackets are warm without being bulky, so she won't mind putting this coat on over other layers. Convenience features like pockets give her all the functionality she needs to enjoy the winter. 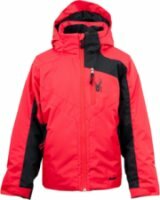 Obermeyer Rosalee Ski Jacket - The Obermeyer Rosalee Ski Jacket packs a powerful style pop in bright colors and a sleek silhouette. This girls' coat has pinstripe herringbone fabric and tons of metal details that add a high-fashion effect. Girls will love the extra-cute fit, and of course, Obermeyer doesn't forget the athletes. 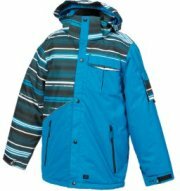 The Rosalee Jacket comes with plenty of warm insulation, tons of pockets for holding gear, and all the extra features that your future-champion skier will need. Obermeyer Stella Ski Jacket - Obermeyer's Stella Ski Jacket offers freedom to move while keeping her warm. Shaped seams fit comfortably and give her a more grown-up look, but they don't restrict her or make her uncomfortable. The Stella Jacket also has a slightly longer length for a more fashiony style and added protection against cold lifts. The insulation on the Stella Jacket is warmer than on many others, so if your girl is prone to being cold it is an excellent choice. Jupa Fredrick Ski Jacket - Jupa’s Fredrick Ski Jacket meets the weather head-on. He can attach or detach the hood to be comfortable in all kinds of weather. When the snow is wet, critical seam taping and Dridux® waterproof fabric keep him dry. Thermadux® insulation keeps him warm anytime the temperature drops. Wrist gaiters and one-hand adjustable sleeve cuffs make it easy to keep snow out of his sleeves. An elasticized powder skirt keeps the snow away from his back so he can stay warmer. Inner Hood with Fleece Panel InsertsForearm Ski Pass PocketBrushed Hand PocketsAntimicrobial Hand GaitersHiking Suspenders. Printed lining with fleece panel insertsAdjustable hoodStrategically seam sealedBrushed hand pocketsPowder skirtPolar hand gaiters. Brushed Microfiber Inner CollarNylon Taffeta LiningThermaWeb InsulationChamois Lens Wipe. Orage Code Ski Jacket - Orage Code Jacket - Junior Boy's: Inner Hood with Fleece Panel InsertsForearm Ski Pass PocketBrushed Hand PocketsHiking SuspendersAntimicrobial Hand Gaiters. Tricot-Lined Hand PocketsFleece Inside Collar and Chin ProtectorFull-Motion, Articulated Sleeve ConstructionFleece-Lined CuffsInternal Zipper WindguardHeavy Duty ZippersInside Goodie PocketSki Pass D-RingWorking CompassAlligator Clip Mitten Retainers with Gator GarageI-Grow SystemReflective Piping. 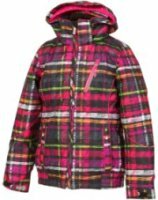 Rossignol Bliss Ski Jacket - Rossignol Bliss Print Jacket – Junior Girl’s: With the Rossignol Bliss Jacket, your little girl can now express her sense of style on the hill while staying warm and dry. It features storm proof 5k fabric, a removable hood, a powder skirt, zip vents, and a ski pass pocket under the powder skirt. The Rossignol Bliss Jacket offers your gal on snow comfort with technical features, making her on hill or walk to school winter bliss. 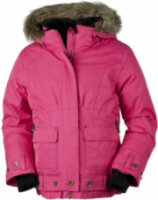 Karbon Shayle Ski Jacket - The Karbon Shayle Ski Jacket is feminine and fun without compromising on features or warmth. The waterproof fabric and warm insulation let her take on the harsher elements and keep warm. Underarm venting means her core stays comfortable. The removable, insulated hood system stays put in the worst conditions to keep her head warm and dry. The seams on the Shayle Jacket are critically taped to prevent moisture from seeping in, so she’s sure to have a terrific day on the slopes.